Last night I was carrying my 1 month old daughter around and the usual techniques didn’t seem to be working. I was on the verge of a collapse worse than Britney Spears after a wild night out when I had a sudden flashback from two and a half years ago (my god, has it been that long?). I had totally forgotten about a hold I used to use with our son when he was just a wee little one. The current techniques we have been using (see here) have worked so well that this one had totally slipped my mind. The way it works is like in the photo. Have your baby straddle your arms, with his head resting on your arm and your hands supporting his body. Make sure your palms and fingers are open wide to spread the weight of his body across your whole hand and not just have it all concentrated in one particular location. Walk around holding your baby like this for a few minutes, combined with some shushing and self relaxing techniques (see here), and you will know the meaning of baby bliss. Give it a try! Join the jam and let us know if you have tried this and if it worked for you! Any other thoughts you would like to share are welcome! I’m trying this as soon as I get home. We’ve found that our little one loves to be in the sling, but I think she gets a little too warm in there sometimes. I’ll definitely give this a try when I get home. Hey, glad to hear you tried out the sling!! We have been using ours all the time with our new little one. They can get warm, depending on the temperature of the room/air, so we adjust accordingly either by exposing the head or feet (if baby is warm) or covering the head/feet (if baby is cold). Hope this hold works out for you too…it really worked well with our boy (as you can see from the picture), but we haven’t used it as much with our girl. This one may be a bit more baby-dependent than the sling. Cheers! 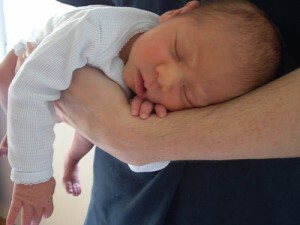 Yes, this was a very nice hold…which my little one has already outgrown…way too fast!